Bipolar junction transistors are often used in physical laboratory and in different electrical and electronic projects for a variety of purposes. Sometimes during experiments or projects, they are required to test functioning of transistors. In general, a transistor tester is done using microprocessor based expensive apparatus and boasts a luxurious indication of transistor terminals using alphabets b, e, and c. Transistor tester is an instrument which is used to test the electrical behavior of a transistor or diode. Multimeters are suitable for both PNP and NPN transistor testing. Quick check in circuit checker transistor tester is used to check whether a transistor is performing properly in a circuit or not. This type of transistor tester specifies to a technician whether a transistor is still operative or dead. The advantage of using this tester is such that among all the components in the circuit only transistor is not removed. This type of transistor tester usually performs three types of tests: Forward current gain, base to collector leakage current with open emitter, and short circuits from collector to base and emitter. A Laboratory Standard Tester is used to measure a transistor’s parameters at various operating conditions. The readings measured by this tester are accurate, and among the important characteristics measured are input resistance Rin, common base and common emitter. The DMM or digital multimeter is one of the most common and useful items of test equipment. It is used to test the base to emitter and base to collector PN junction of a BJT. 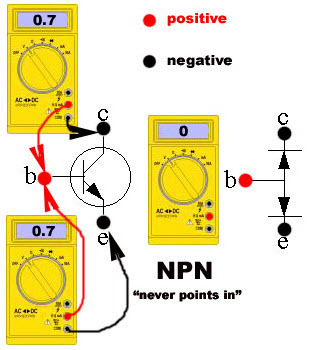 A digital multimeter is used to test the base to emitter and base to collector PN junction of the BJT. By using this test, you can also identify the polarity of an unknown device. PNP and NPN transistor can be checked using the digital multimeter. The digital multimeter consists of two leads: black and red. Connect the red (positive) lead to the base terminal of the PNP transistor, and the black (negative) lead to the emitter or base terminal of the transistor. The voltage of a healthy transistor should be 0.7V, and the measurement across the emitter collector should read 0.0V. If the measured voltage is around 1.8V, then the transistor will be dead. 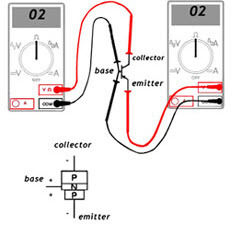 Similarly, connect the black lead (negative) to the base terminal of the NPN transistor, and red lead (positive) to the emitter or collector terminal of the transistor. The voltage of a healthy transistor should be 0.7V, and the measurement across the emitter collector should read 0.0V. If the measured voltage is around 1.8V, then the transistor will be dead. 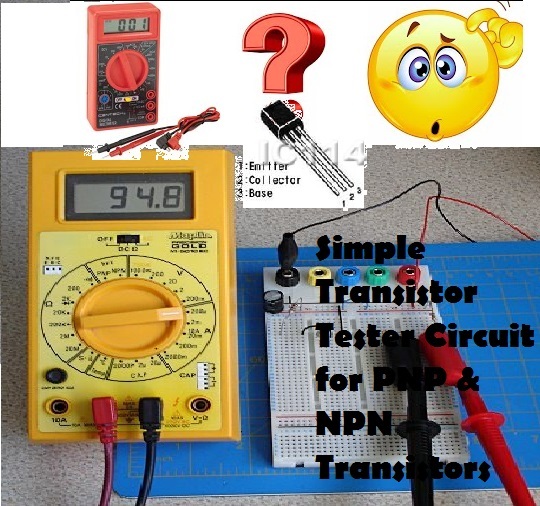 This transistor tester circuit that uses 555 timer IC is fit for testing both PNP and NPN transistors. This circuit is simple as compared to other transistor testers, and therefore, is useful for technicians as well as students. It can be easily build up on a general purpose PCB. 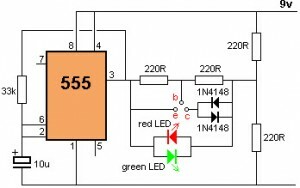 To develop this circuit, basic electronic components like resistors, diodes, LEDs and NE5555 are used. By using this circuit, different faults can be checked –like to know whether the condition of a transistor is good or not, and opened or shorted, and so on. NE 555 Timer IC is a multivibrator that works in three modes: astable, monostable and bistable. Also, this circuit can work through a battery for a long duration. When no transistor is connected to the tester, the green and red LEDs flash alternatively. When transistor is place on the test lead, both the LEDs blink. If only one LED blinks, the condition of the transistor will be OK. If the voltage is only in one direction, it will produce short across the LED pair. If none of the LED flashes, the transistor will be shorted – and, if both the LEDs flash – the transistor will be open. The above one is a simple transistor tester circuit; wherein Quad2 input CMOS, NAND gate IC, CD4011B is the heart of the circuit. In this circuit, we have used two LEDs for displaying the condition. 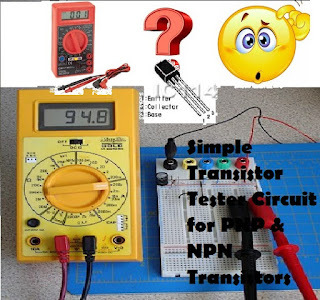 By using this circuit, we can test both transistors PNP as well as NPN. Inside the IC, out of the four NAND gates, only three gates are used. These gates are used as NOT gates by shorting their input terminals. Here, resistor R1, capacitor C1, gates U1a and U1b forms a square wave oscillator. The frequency of this oscillator is adjusted by using the resistor R1, and the output of the oscillator is inverted using the gate U1c. The inverted and non-inverted oscillator outputs are connected to the base of the transistor under test through the resistors R2 and R3. Under test, the status of the Light Emitting Diodes indicates the condition of the transistor. If red LED is ON it indicates that the NPN transistor is good. If green LED is ON it indicates that the PNP transistor is good. If both LEDs are ON, it indicates that the transistor under test is short. If both LEDs are OFF, it indicates that the transistor under test is open or bad. Thus, this is all about the transistor tester circuit and digital multimeter. Transistor testers have essential switches and controls for making proper current, voltage, and signal settings. In addition, these transistor testers are designed to check the solid-state diodes. There are also preferred testers for checking high transistor and rectifiers. Apart from this, if you have any queries regarding this topic, you can comment below in the comment section.